It was a rainy day in Albany, but the mood was upbeat as a group of arts advocates made their way to legislative offices. The mission was a $4 million lift for the New York State Council on the Arts (NYSCA). A contingent from Westchester, including Dominick Balletta from the Jacob Burns Film Center; Eileen Nieman and Holly Kennedy from Rye Arts Center; Kevin Melchionne of Hoff-Barthelson Music School; two arts administration students, Jessie Pauli and Sara Fasano, from SUNY Purchase; and ArtsWestchester staff joined colleagues from other parts of the state. Among them were Steve Butler from Syracuse, Diana Cherryholmes of Huntington, Long Island, and Kay Stamer from Greene County. 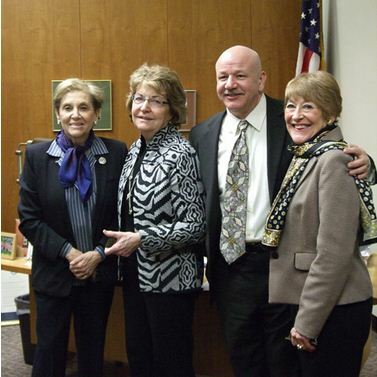 Once there we first met with our Westchester delegation, which as a whole is always very supportive of the arts. Then, we met with Senator Betty Little who chairs the Senate Cultural Affairs, Tourism, Parks and Recreation Committee, and Assemblywoman Marge Markey who chairs the Assembly Committee on Tourism, Parks, Arts and Sports Development. We were encouraged by what we heard from the committee chairs, who agreed to put forward our request. 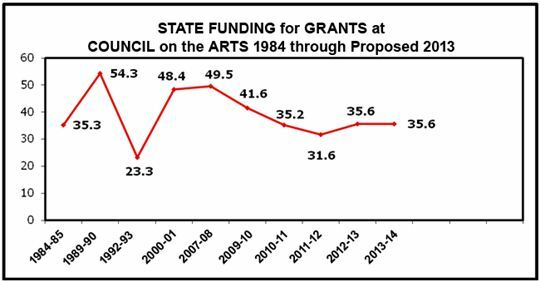 The New York State Council on the Arts has suffered a 35.5 % reduction over the past five years, which has left the cultural sector woefully underfunded. A chart prepared by Norma Munn of the New York City Coalition charts the decline over many years. If you are as concerned as we are, please take a moment to write to the Governor at the below address or emailing via this link.